What could make a Mazda3 more delicious? Candy, for one. Also, a V8 stuffed in there for good measure. Have we mentioned that the fellows at MARC have done this before with a humble V8, rear-wheel-drive Focus, and that they're running all of these cars in the Bathurst 12 Hour this weekend? Aww yes. This seems like the most Australian idea ever, but it's one of the best: take humble compact car, add V8, boom: race car. MARC Cars Australia runs these hilarious little Porsche-hunting compact cars in international endurance events like the Zandvoort 12 Hour and the Barcelona 24 Hour of the Creventic Series, but it's their home race at the Bathurst 12 Hour that's this weekend. Bathurst's Mount Panorama is a circuit built into the side of a mountain. Walls are close. Views are spectacular. The Conrod Straight is the longest straight in touring car racing. It's the best possibly venue to pit these pocket rockets against all manner of other endurance and GT3 cars. Check out the rest of the entry list: there's everything from Lamborghini GT3s to Exige Cups to a single Daytona Coupe. 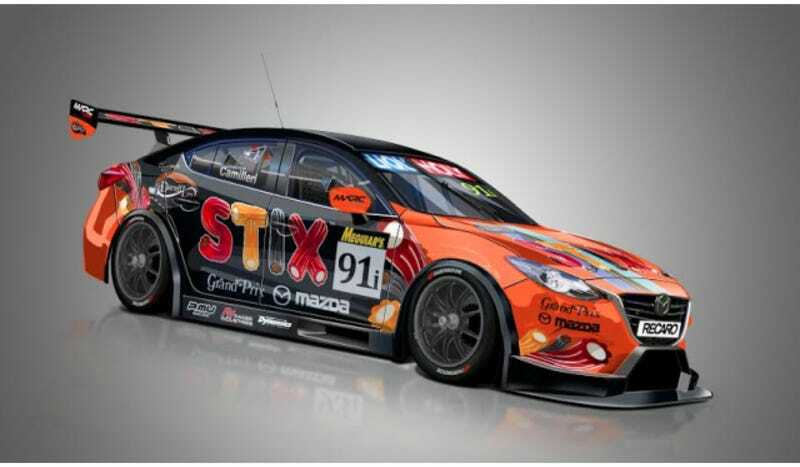 MARC has, of course, worked with V8 Supercars in the past, but those are just so big compared to the Mazda3 and Focus. Like its Focus twins, the MARC Mazda3 will be converted to rear-wheel-drive and run a 500-hp 5.0-liter Ford Coyote V8. And sure, it's basically a tube-frame race car underneath, but it's still the lovely size and shape of a Mazda3. At Bathurst, the V8 compact cars from MARC will run in a class for non-production invitational entries, Class I. There, they will run against a couple Grand Am Mazda RX-8s. Its sights are set on beating members of Class B, however: the class made entirely of Porsche GT3 Cup cars. Overseas we race pretty hard against the 997s, so that's where the race is for us. They're a bit quicker in outright speed but we cover about the same distance over two hours, which is what we really focus on. The Bathurst 12 Hour starts at 1:50 PM [American] EST on Saturday, Feb. 7, for those of you following it from the United States. Radio Le Mans covers it every year, and the Bathurst 12 Hour folks will have a live stream going as well. In addition to the international endurance events, MARC's V8 compacts have been approved to run in the Kumho V8 Touring Car Series. Hopefully they'll pop up in more places because that's a V8 version of a normal little grocery getter. Hating that is like hating burnouts, doughnuts and everything else good in this world. As for the Mazda3's delicious livery, I'm not sure I could deal with a candy sponsorship unless they just sent over money, though. That being said, if Cherry Ripe is somehow interested in a ChumpCar, let me know. I'll get super-fat and enjoy every delicious bite of it.